A possible chlorine leak at a hotel in Franklin prompted a large emergency response on Saturday night. 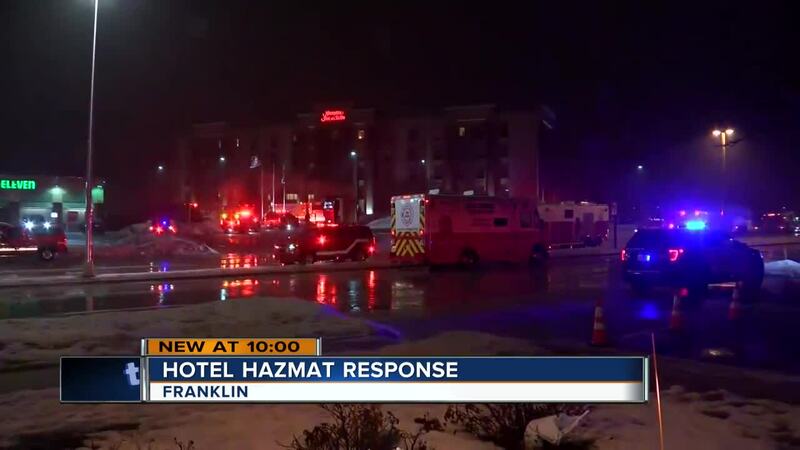 FRANKLIN -- A possible chlorine leak at a hotel in Franklin prompted a large emergency response on Saturday night. It happened just before 7 p.m. at the Hampton Inn -- located at S. 76th Street. Roughly 20 people in the pool area of the hotel were evacuated after multiple people reported a strong chlorine smell and feeling violently ill. Several people also reported having eye and skin irritations. The Franklin Fire Department responded -- but didn't have the proper equipment to monitor for chlorine -- so the Milwaukee Hazmat Team was called. The pool area was checked and no leak was detected.